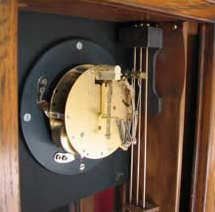 The quartz movement has revolutionized the clock world. It is extremely durable, silent, accurate, and requires attention only about once a year to change the battery. The perfect movement for clocks in the “present time”. 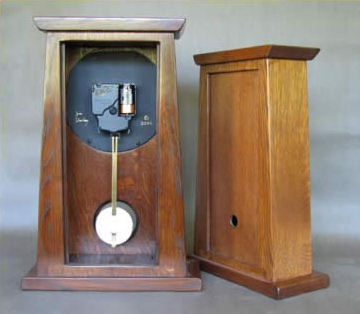 There are two different quartz chiming movements available. The Tubular Bell electronic chiming movement is “state of the art”, but it is still an electronic chime and sounds best when set at low levels. It is available in most clocks with a 5″ face or larger. The quartz hammering chime uses actual hammers hitting tuned rods and has more of the sound of a real mechanical movement. Its one draw back is that it is quite loud, however, there are methods to make it quieter. It is a large movement and fits only with certain models with an opening door. The additional cost for both quartz chimes is $75. The Mechanical movement is an art form unto itself. There is nothing like the gentle ticking and the rich chimes of a mechanical movement. I work with Ron Zentner, a musician, mechanical engineer, and clock genius, to outfit certain models with Hermle chiming mechanical movements. There are two types of chimes, the “bim bam” and the “coil gong”. The cost of the Hermle mechanical movement is an additional $350, and they do require certain conditions to operate successfully. Since they will require some future maintenance and cleaning, it is advised that you have a reputable service technician in your area. For more information you can read my blog page about mechanical movements.